This site is dedicated to Lev Karlovich Okkelman. 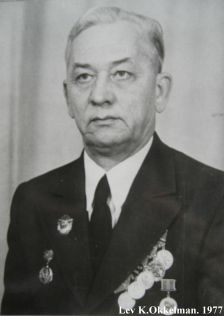 He is a pilot-instructor, veteran of the Great Patriotic War, a person who met a space ship-satellite with the dog Zvezdochka on board, and one of those who founded the Izhevsk airport and aviation in Udmurtia. Those who know Lev Okkelman have heard lots of his stories about these events in his life. There are many articles and videos about it. Once it was decided to collect this information altogether. Thus this site has been created. Lev Okkelman wrote this CV in 2008. The part Memorials contains a photo of the monument to the dog Zvezdochka, obelisk put up in honor of the space ship-satellite landing, map of the area of the space ship-satellite landing. The part Awards contains medals, letters of award, rationalization certificates and letters of congratulation on the Victory Day. One can find photos of Lev Okkelman, planes he aviated and a photo of his family in the part Photos. Any comments, notes and additions are welcome. Please, send them by e-mail to Contacts or leave a message at Guest Book.